Felsic volcanic rocks have long been considered a primary source of uranium for many kinds of uranium deposits, but volcanogenic uranium deposits themselves have generally not been important resources. Until the past few years, resource summaries for the United States or the world generally include volcanogenic in the broad category of "other deposits" because they comprised less than 0.5 percent of past production or estimated resources. Exploration in the United States from the 1940s through 1982 discovered hundreds of prospects in volcanic rocks, of which fewer than 20 had some recorded production. Intensive exploration in the late 1970s found some large deposits, but low grades (less than about 0.10 percent U3O8) discouraged economic development. A few deposits in the world, drilled in the 1980s and 1990s, are now known to contain large resources (>20,000 tonnes U3O8). However, research on ore-forming processes and exploration for volcanogenic deposits has lagged behind other kinds of uranium deposits and has not utilized advances in understanding of geology, geochemistry, and paleohydrology of ore deposits in general and epithermal deposits in particular. This review outlines new ways to explore and assess for volcanogenic deposits, using new concepts of convection, fluid mixing, and high heat flow to mobilize uranium from volcanic source rocks and form deposits that are postulated to be large. Much can also be learned from studies of epithermal metal deposits, such as the important roles of extensional tectonics, bimodal volcanism, and fracture-flow systems related to resurgent calderas. Regional resource assessment is helped by genetic concepts, but hampered by limited information on frontier areas and undiscovered districts. Diagnostic data used to define ore deposit genesis, such as stable isotopic data, are rarely available for frontier areas. A volcanic environment classification, with three classes (proximal, distal, and pre-volcanic structures), permits use of geologic features on 1:500,000 to 1:100,000 scale maps. Geochemical databases for volcanic rocks are postulated to be more effective than databases for stream sediments or surface radioactivity, both of which tend to be inconsistent because of variable leaching of uranium from soils. Based on empirical associations, spatial associations with areas of wet paleoclimate, adjacent oil and gas fields, or evaporite beds are deemed positive. Most difficult to estimate is the location of depositional traps and reduction zones, in part because they are mere points at regional scale. Grade and tonnage data are reviewed and discussed for 32 deposits in the world. Experience of mining engineers and geologists in Asia suggests that tonnages could be higher than presently known in the Western Hemisphere. Geological analysis, and new data from Asia, suggest a typical or median deposit tonnage of about 5,000 tonnes U3O8, and an optimistic forecast of discoveries in the range of 5,000 to 20,000 tonnes U3O8. The likely grade of undiscovered deposits could be about 0.15 percent U3O8 , based on both western and eastern examples. Volcanic terrane is under-explored, relative to other kinds of uranium deposits, and is considered a favorable frontier area for new discoveries. 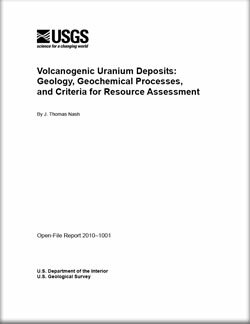 Nash, J. Thomas, 2010, Volcanogenic uranium deposits—Geology, geochemical processes, and criteria for resource assessment: U.S. Geological Survey Open-File Report 2010-1001, 99 p.